Emotional tributes to anti-apartheid activist Winnie Madikizela-Mandela have poured in during an hours-long memorial service attended by thousands in Soweto. Ms Madikizela-Mandela died on April 2nd at the age of 81. "The embodiment of courage. The embodiment of resilience. The embodiment of strength," poet and singer Mzwakhe Mbuli said during a performance at the service. "There's no grave big enough to bury her legacy." The death of Ms Madikizela-Mandela, often called the Mother of the Nation, has triggered widespread soul-searching in South Africa over the legacy of one of the nation's most important fighters against racial discrimination, who was also dogged by scandal. During the decades of imprisonment of her husband Nelson Mandela, Ms Madikizela-Mandela helped keep the plight of the political leader and the gross injustices of the apartheid system in the global spotlight, her own face and voice becoming synonymous with the anti-apartheid struggle. In the week since her death in a Johannesburg hospital, there has been a surge of support for a woman whose fearlessness and defiance helped bring an end to apartheid but whose public image was tarnished by controversy. 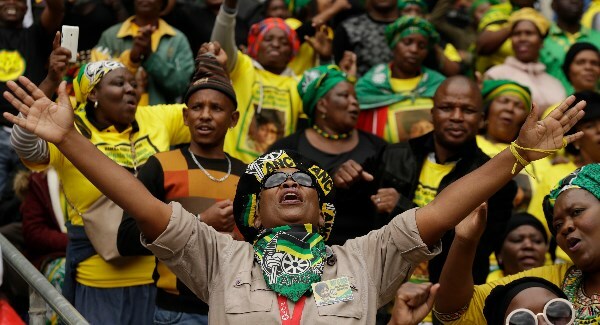 Under the social media campaign "Winnie has not died she has multiplied," scores of young women have posted pictures of themselves wearing doeks, the traditional head wrap that Ms Madikizela-Mandela frequently wore. The ruling African National Congress (ANC), with which Ms Madikizela-Mandela had a rocky relationship over the years, has held memorial events across the country, including Wednesday's ceremony at Soweto's Orlando Stadium and an official funeral scheduled on Saturday. Swelling African hymns by the Soweto Gospel Choir brought the thousands attending Wednesday's memorial to their feet and they swayed and sang along. Many attending wore T-shirts bearing Ms Mandikizela-Mandela's image. The crowd filled about half of the 40,000-seat stadium. Ms Madikizela-Mandela's family members and supporters lashed out at her detractors during their speeches. "She gave everything she had," said ANC deputy secretary general Jessie Duarte. "For those of you whose hearts are unforgiving, sit down and shut up. This is our hero. This is our heroine." Ms Madikizela-Mandela grew up in what is now Eastern Cape province and came to Johannesburg as the city's first black female social worker. Not long after, she met ANC activist Mr Mandela and the couple married in 1958, forming one of the most storied unions of the 21st century. After Mr Mandela was imprisoned on Robben Island, Ms Madikizela-Mandela embraced her own leadership in the freedom struggle with steely determination and at great personal sacrifice. For years, she was routinely harassed by apartheid-state security forces, imprisoned and tortured. She was often away from her two daughters with Mr Mandela, and in 1977 she was banished to a remote town in the middle of the country to separate her from the heart of the movement she led in Soweto. "You decide to choose between the nation and your young children and it was a very difficult choice to make," Ms Madikizela-Mandela said in 2013. "Even to this day, a parent like me still feels that guilt." Those years of harassment and stress were not without their toll. When Ms Madikizela-Mandela returned from exile to Johannesburg, she became involved with a group of young men known as the Mandela United Football Club, who were widely blamed for violence in Soweto, where she was living. They were accused of the disappearances and killings of at least 18 boys and young men and the group's leader was convicted of killing a 14-year-old boy, nicknamed Stompie, who was accused of being a police informer. In 1991, a court found Ms Madikizela-Mandela guilty of the boy's kidnapping and assault and sentenced her to six years in jail. Ms Madikizela-Mandela steadfastly denied any knowledge of any killings. Mr Mandela divorced her in 1996 claiming infidelity and saying that after his release from prison, his wife made him "the loneliest man". Though she fought fiercely for democracy, the political career that Ms Madikizela-Mandela embarked on after the first free elections in 1994 floundered. Mr Mandela sacked his wife as one of his deputy ministers in his first cabinet, and her stints as a politician, a post she held until her death, were lacklustre. "Was she a sinner or was she a saint?" Inkatha Freedom Party leader Mangosuthu Buthelezi asked during the memorial. "I believe, as (Nelson Mandela) did, that a saint is not somebody who never sinned. A saint is somebody who died trying."